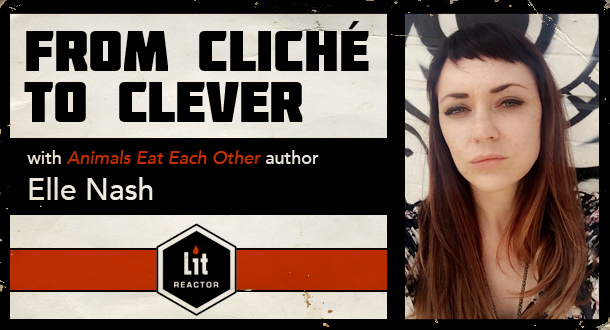 Learn how to identify and remove cliches from your work and develop your unique voice in this three-week workshop with acclaimed author Elle Nash. How do you elevate your prose from cliche to clever? Metaphors serve an important purpose—they pull forth an image to render a specific emotional feeling to a reader. But sometimes, those metaphors become overused and can create a text that is dull and cliche, which then fails to express the type of emotional response you want. Your goal as a writer is to “bring the reader to their knees”—that is, to wrap a reader so fully into the emotional and spiritual content of the work that they feel moved by it (or as Lidia Yuknavitch says, art doing its verb thing). In this class we will learn how to identify cliche text and then twist, turn and unpack these phrases to 1) create a more unique voice, one that is yours and yours alone and 2) create more sensory detail in the story. And your guide will be Elle Nash, author of the acclaimed Animals Eat Each Other, which was hailed in a starred review in Publishers Weekly as "a complex, impressive exploration of obsession and desire." Elle is also a founding editor of Witch Craft Magazine and a fiction editor at Hobart Pulp, and her work has been featured in places like Volume 1 Brooklyn, The Fanzine, Cosmopolitan, Elle, The Offing, and Enclave. You will explore a brief history of metaphor use in the contemporary novel, why writers have come to use them (and overuse them), and the psychological/emotional effects of metaphors in the work. You will discuss how to identify a cliche. This week you will discuss how to use the five senses to unpack overused or bad metaphors to get at the emotional root underneath the cliche. This week you'll discuss why some writers choose not to use any metaphors or similes at all, and discuss tools for deciding when to use metaphors or similes to enhance the work. *Each week will include writing assignments, that will be critiqued by Elle and your classmates, as well as reading assignments selected by Elle, and discussion opportunities.